'Me.No.Pause' was created by Pablo London. 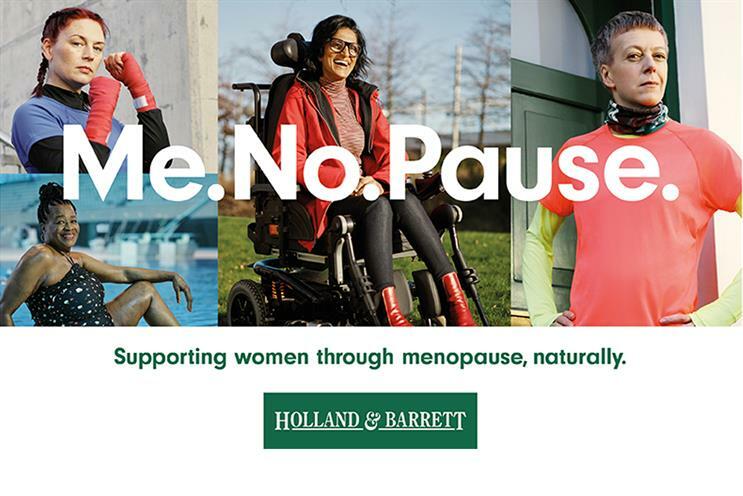 Holland & Barrett is launching a campaign to break the silence surrounding the menopause after winning a competition to increase diversity in advertising across London’s transport network. 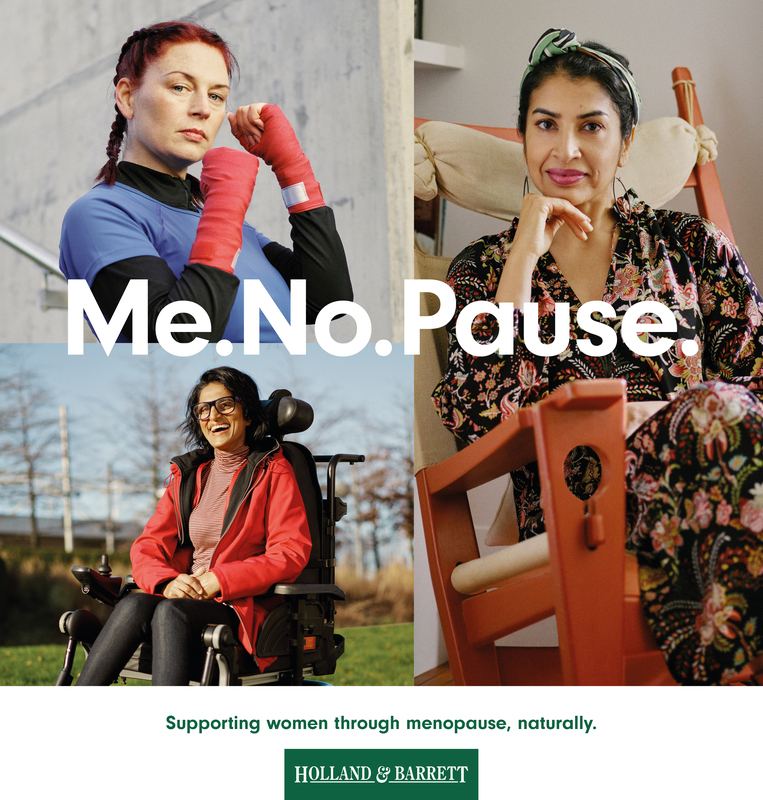 The "Me.No.Pause" campaign, created by Pablo London, will be supported by £500,000 worth of ad space from Exterion Outdoor and JCDecaux across the Transport for London network, including digital screens at Canary Wharf. The competition called on brands to create ads that reflect London’s diversity, feature women from all backgrounds and drive a move away from harmful gender stereotypes. Caroline Hipperson, chief marketing officer at Holland & Barrett, said the menopause is the "last taboo" topic that people still don’t talk openly about, despite the fact that it is a natural part of life and something all women will experience. She said: "By partnering with City Hall and TfL, we will now be able to convey this message over 31 million journeys. We hope this campaign will give all these amazing women the confidence to talk about what they are going through and seek advice or tips on how to alleviate any symptoms if needed. "And we are taking this seriously in store too; we have invested in training for all our store colleagues on the topic, so we hope women experiencing the menopause come in and speak to us." Despite being an inevitable life stage for women, the menopause has largely been ignored by advertisers. As Cindy Gallop, founder of MakeLoveNotPorn, told Campaign last year, the menopause is one of the most taboo and least talked-about topics in society generally, and in advertising and the ad industry particularly, yet it affects everybody. Mothercare, which was named runner-up in the competition with a campaign celebrating mothers, will receive £50,000 of digital ad space on the transport network. The brand is launching "Unseen mums", a campaign that champions the post-birth body, representing a part of motherhood that is rarely portrayed in marketing. Created by Mcgarrybowen, the work seeks to normalise mothers’ experiences, spark a positive conversation and help them feel confident and proud of their bodies. Liz Day, parenting consultant at Mothercare, said: "We hope that the honest photos in our ‘Unseen mums’ campaign showcase the diverse reality of the post-birth body and offers reassurance for mums that every body is beautiful and unique. From surgical scars to stretch marks, we want to celebrate the true journey of motherhood and that includes the physical changes to the body." The competition was judged by: Claire Beale, global editor-in-chief of Campaign; Staynton Brown, director of diversity and inclusion at TfL; Vanessa Kingori, publishing director at Vogue; Selma Nicholls, founder and chief executive of Looks Like Me; Leila Siddiqi, head of diversity at the IPA; Leah Kreitzman, mayor director for external affairs at Greater London Authority; and Chris Macleod, customer director at TfL. It is part of a broader push by Mayor of London Sadiq Khan to ensure that advertising better reflects the diversity of society. Research from University College London, called The Women We See, found that many Londoners do not feel represented by ads in the capital, with only 27% of respondents believing that they are relevant to them, while more than half (51%) of Londoners of a black, Asian or minority-ethnic background said their ethnicity isn’t well-represented in London’s advertising. In 2016, TfL moved to ban ads that could reasonably be seen as likely to cause pressure to conform to an unrealistic or unhealthy body shape or likely to create body confidence issues, particularly among young people. Heidi Alexander, deputy mayor for transport, said that London’s diversity is its greatest strength: "It is important that we challenge the disparity between the way women are represented in adverts and the women we see around us every day in the capital." Alexander hopes the campaign will encourage other brands to tackle the way they represent women in advertising. She added: "We want today’s campaign launch on TfL’s advertising network to encourage other brands to tackle the way we represent women in advertising, ensuring that women at the heart of London’s success are given the representation they deserve."